We all possess a remarkable ability to understand and incorporate new and more productive ways to succeed, but it take the right teachers, trainers and programs to release this exciting potential. 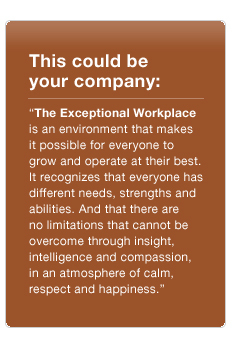 Backed by twenty years experience in clinical and organizational psychology, The New Temperament can help your company develop a working environment that supports the highest levels of teamwork and interpersonal functioning for new levels of achievement. Human resource manager and accredited health-care professionals are invited to email us at training@thenewtemperament.com to learn more about our training and executive coaching services. Businesses and educational, governmental and not-for-profit organizations that are interested in volume discounts may contact us at training@thenewtemperament.com. We are also available to provide comprehensive individual assessments and in-person presentations.